Bring cream and butter to a boil in a medium sized saucepan over medium heat. Remove pan from heat and stir in chocolate until melted. Cool saucepan in the refrigerator for about an hour, or until firm enough to shape into balls. Roll chocolate into 35 balls, place on a small sheet pan, and freeze for about 5 minutes. 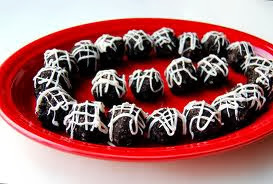 Place Oreo cookie crumbs in small bowl and roll chocolate balls into the mixture, coating completely. Drizzle melted white almond bark on top, if desired. 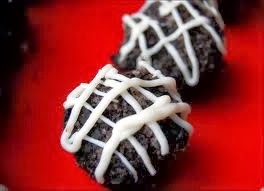 51 comments on "Oreo Truffles"
another brilliant idea-you are one smart oreo cookie! 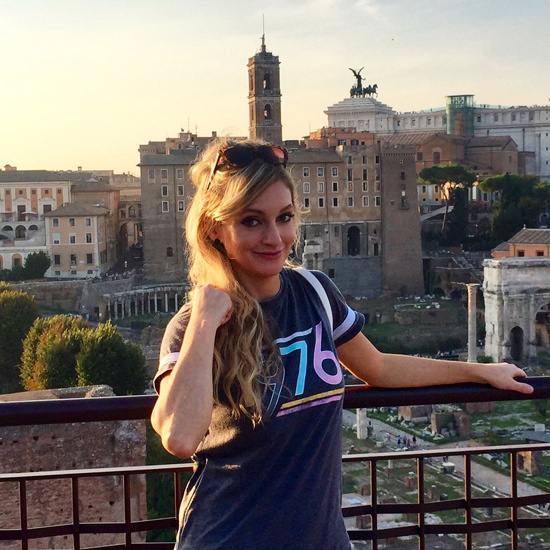 I stumbled across your blog a few days ago, and I just wanted to tell you - I FREAKIN LOVE IT! Your pics are awesome & recipes creative and devine! I would DIE for one of these right now!! Oh, my family would love these truffles...I would love them too. They are beautiful yet easy to make. A perfect Valentine treat. Happy V day to you Emily. I am loving all your treats! i'm not sick of listening to you ramble! you are hilarious. oh i so wish i could've seen your titanic valentine box!! i hope you took pictures before you threw it away. Looks so good! In Belgium, we can only buy these cookies in special supermarkets! But I will make these beautiful ones! thanks! You should have at least posted a picture of that Titanic box before you threw it away. I want to see it! You have me all curious now. Veryfun idea for truffles. I'd rather get a truffles than a Superman card. I remember the corny book of popout Valentines I bought almost every year to hand otu to my class. I was nice and gave cards even to people I hated. They were sooooo cheesy with teddy bears and hearts and girls in frilly dresses. Oreo + truffle = YUM!!! These look amazing. Yum, I've seen those so many times & have yet to make them. Other yummies keep popping up in the way. Woman! You are seriously evil, tempting me like this. how cooool! LOL the titanic? are you.. 21? cause i was in the 6th grade when the titanic movie came out, too! Seriously, these look outta this world! 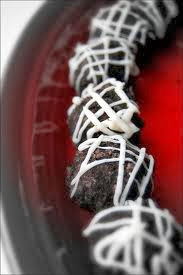 I agree.....Valentine's Day is for sweet and decadent things....and your truffles fits the bill. Yum-yum!!! Titanic?? yes i was VERY into it...disgustingly so, to the point that i had massive movie posters of it all around my bedroom. eek! Delicious! Gorgeous!!! Happy Valentine's Day! Oh these look yummy! Super easy too, which is always nice when it comes to desserts. Great idea! Also, regarding Titanic, I am pretty sure I saw it in the theater a few times, still watch it whenever it is on TV and still cry like a baby at the end. We have a family friend who always makes truffles as gifts each christmas and they are TO DIE FOR. She continually refuses to give me the recipe. Now- I don't need hers! Take THAT! Wish I had a bag full of those for Valentine's! 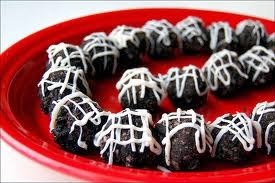 I love making oreo truffles. They are always a hit!! Happy V-day to you! I hope you have a great weekend! Hi Em, I hope that you receive the best Valentine ever this year. I love the sound of your Titanic card holder - you were obviously always very creative. These truffles look mazing - you know me and chocolate. Lucky person who receives these for Valentines Day! These look amazing, I'm a huge oreo fan! you are on a roll with the truffles!! these sound great! and they're so beautiful, with the drizzle. i love them. Why did you not take pictures of the masterpiece? It had to have been the coolest Valentine Box ever. We were discussing that they no longer make Valentine Boxes. What a shame! This momma is going to bring back the tradition when my kids hit Kindergarten. You seem to always know my favorite foods! I mean, oreos? What's not to love! I cannot wait to try these awesome-looking truffles! Oh! that movie drove me insane! But these truffles don't...I swear you have the best stories! These look so easy to make, and of course they look delicious! Very cool recipe. Have a great valentines! I actually am a fan of scratch and sniff, especially the ones that smell like desserts...I never saw titanic until college or high school, believe it or not :P. You need to put together a box of all these truffles you've made, now that would be an awesome valentine's day gift! Well, where's the picture of the Titanic model? I bet if you sent Leo some of these truffles, he's drop Bar in a second. Who cares about those ok pictures of her in Sports illustrated anyway? I know feel like eating oreo truffles and screaming "I'm the queen of the world" with my arms wide open! Beautifu truffles. Happy belated Valentine's wishes. I don't think I've ever had my mouth water so much simply from a photo. I want one of these NOW! They look absolutely divine, Em. I was a senior in High school when Titanic came out and I dragged my boyfrined to see it about 5 times. I still think Leo is hot though. Yum! We love these. Our recipe is the same, but no chocolate chips.We also dip them in the chocolate, but the older I get the more I don't like them dipped so I think I will drizzle like you did next time. It's funny how people from all over have similar recipes. In high school, all us girls looooved Titanic. My senior year, my mom and I made my dress- it was a replica of Rose's dress from the begining of the movie when she's going to throw herself off the back of the boat- the red one with a black overlay. The dress was gorgeous and perfect. In fact, I've lost almost 40lbs since high school, but I still can't bring myself to get rid of that dress, even though it no longer fits. Made them and ate until I got nauseous :p Lovely!